There are 10 posts filed in Ink (this is page 1 of 1). I posted last year about the Airmail 69L eyedropper – a simple, well made, large capacity pen – and I thought I would write a little follow-up. A writing pen – this can be almost anything depending on my tastes at the time, as long as it is loaded with some reasonable ink that isn’t red, and I have it with me. A red editing pen. When I am “processing” my journal I read over previous entries and add tasks based on them, or copy them up. When I do this I write what I have done next to the entry with the date that I did it (e.g. “16/2/2012 tasked”) and, when everything on a page is dealt with, I cross the page number out. I do all this in red. Sometimes I write little comments on the page as well. These are often sarcastic. A highlighter, optionally, to emphasise things while I am writing them, as immediate editing. For #3 I use the Pelikan Duo highlighter. That one is a easy choice. There isn’t a lot else that the Duo is actually for. For #2, I played with a few solutions, but ended up buying another Airmail with a red cap that I fill with Noodler’s Empire Red, slightly diluted. An editing pen needs to have a fine nib, since you may have to fit notes into limited space, and it needs to reliably work regardless of how long it was since you last picked it up, since I edit quite unpredictably. The Airmail works very well for both of these. It doesn’t dry up easily and if it does, it’s very easy to re-prime – just unscrew it a bit, point it downwards, screw it up until a drop of ink appears on the nib, then turn it to point upwards and finish tightening it. For #1 I use whatever pen I have at hand, but generally I carry a spare in my bag, and that has ended up being the original Airmail most of the time, for similar reasons – it writes reliably whenever I need it, and it’s better to have a spare with a fine nib to cover more possible uses (a pen can be too broad for a purpose, say drawing diagrams, but it’s much rarer that it is too fine). Increasingly frequently, I think “you know what, I can’t be bothered with another pen, I’m just going to use the Airmail”. I still load it exclusively with Noodler’s Heart of Darkness, which I rarely put in anything else. I have a large bottle of HoD which has an eyedropper built into the cap – this makes it ideal for filling eyedropper pens, but awkward to fill other pens from. (The eyedropper arrangement comes out of the bottle covered with ink, so has to be wiped down or put somewhere impermeable if one is going to fill a pen straight from the bottle, and this always means getting ink all over my fingers.) HoD is an excellent black that suits almost all occasions, being fast drying, dense and permanent. The pen itself has proved to have just as good a nib as I thought initially – fine but smooth, really quite amazing for a sub £10 pen – and the shape and balance make it very easy to write with. It’s really only when I have a fancy to use a new ink in a broad nib as part of some pretentious writerly mood that I use something else. Perhaps this means I am getting boring, but the Airmail has certainly ended up high on my favourite pen list. I gave it a positive review when I first got it, and a year later I’m glad to see I was right. So, buy one. Or more. I may get some in different colours. This speciality fountain pen was released by Pelikan last year, but I hadn’t ordered one until now, when I just gave up trying not to. The concept is that it is (a) a demonstrator – i.e. 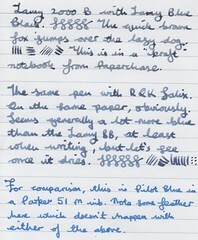 has a transparent outer casing (b) has a BB (double broad) nib and (c) is to be loaded with highlighter ink. Yes, it is a highlighter fountain pen. 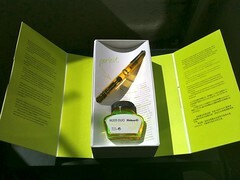 It comes in an absolutely lovely display box. This is the nicest packaging that I have seen for a fountain pen – even the fancier ones I have tend to come in little “jewelry boxes” which could contain anything, well, anything long and thin. 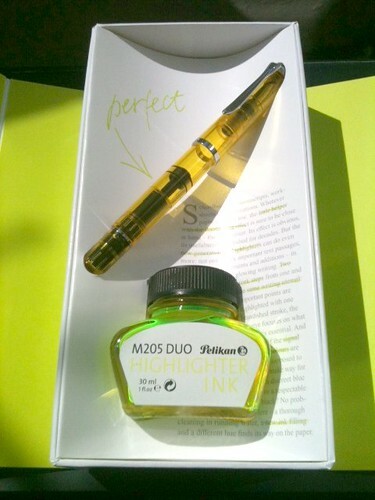 In contrast, the M205 Duo’s packaging is very specific to the particular pen and suits it perfectly. 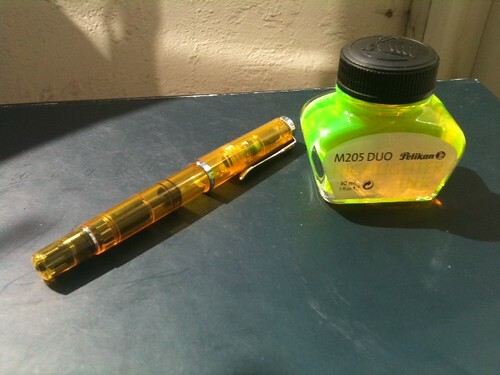 The pen itself is a standard M205, except that it is a yellow demonstrator. (If you have an M200, which I do, it’s basically the same pen but with silver trim instead of gold.) It’s smaller than it looks in the pictures, but not too small even for those of us with fat fingers, and extremely lightweight. It seems quite orange in the picture below, but it isn’t, really, that orange – that is the light. 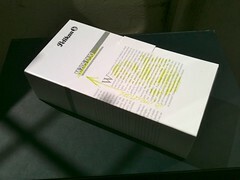 The Duo comes with a 30ml bottle of Pelikan radioactive1 fluorescent highlighter ink, and again, we come up against the limits of photography: it is not as green as it looks in the photograph below. Though it does still have a bit of a green tinge. Here is a scan of some writing with it, which is heavily adjusted to try to make it a bit more obvious the difference in line widths. It’s basically impossible to scan fluorescent ink and have it look like real life. Let me emphasise that it this is just for nib size comparisons. What does the ink look like in practice? Imagine a particularly bright yellow highlighter that has not had a chance to dry out at all, and has been freshly uncapped. When considering the benefits of this sort of pen for use in practice, imagine that it will continue to be like that indefinitely, rather than drying out a bit and being disappointing (which has always happened with ink highlighters that I’ve used) and if it ever starts to run low you can just top it up. This is the benefit of a fountain pen highlighter, the regular flow. The pen writes very smoothly, and if you are after a BB nib for other purposes apart from highlighting, an M205 BB nib unit will likely please you. The line is certainly thinner than you would normally get from a normal highlighter, which means that it is best for underlining and circling, but you can colour in larger sections if you really want to, and the size gives the advantage that you can also write short notes with it. I was asked when showing this off whether you could use another ink and the answer is of course yes – it’s a piston filler and you can load it with any ink you fancy. You can also change the nib for a narrower one; I bought mine from Pelikan Pens, and they offer nib replacements pre-order, or you could buy another nib later on (Pelikans are very easy to change nibs with, the units just screw out and in again). The question is a fair one. I bought mine because… all right, I can’t really explain it, I just loved the idea. I don’t even do much highlighting, though I will be making an effort to do more. you do a lot of highlighting, have some disposable income, and want something high-quality to highlight with. This isn’t just a novelty item, it really is a good highlighting pen. The ink flow is regular and the nib, while broad, is still a lot more precise than a squishy felt tip. I couldn’t honestly tell you that it would save any money, but it would be a more effective tool. you want to buy a present for somebody who does a lot of highlighting, and likes pens. The box really is lovely. Do you have any academics, lawyers, students or other people who review a lot of paper papers in your life? Is it their birthday soon? Are you sure they wouldn’t rather have a case of wine? Bear in mind that you can buy this as well as a case of wine. Go on, they deserve it. It’s only money. You can’t take it with you. I first tried Rohrer & Klingner inks when I saw that they had an purple iron-gall ink called Scabiosa, which is rather an unpleasant name for a nice ink that behaves much like J Herbin Poussière de Lune but with more shading and permanence. I don’t hear an awful lot about R&K inks on the net, but the three that I’ve tried so far seem to be good performers – all fairly dry so you do need a fairly wet pen. Anyway, Salix. As you can see from the pictures in this post I tested it first with a Lamy 2000 with a broad nib, which was loaded with Lamy Blue Black when the Salix arrived. 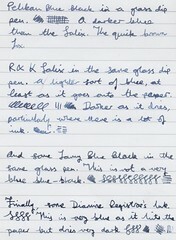 It behaves very much like Lamy BB – I’ve read that it is “drier” but I can’t see that myself. It flows well and consistently. The major difference between it and the Lamy BB is that it’s noticeably more blue, though not really blue in comparison to blue inks. (Lamy BB simply is not blue when it dries, I’m sorry. At least it’s not turquoise.) I prefer either dark or muted blues, myself, so that’s fine for me, but if you’re looking for an iron gall Waterman Blue this is not it. 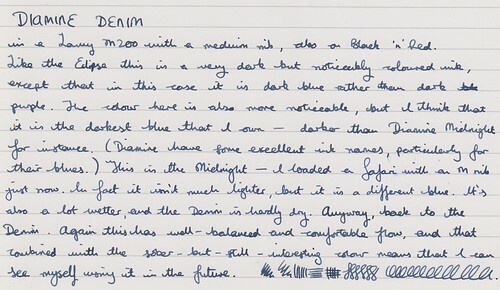 It’s quite similar to Pelikan Blue Black in colour; it reminded me a bit of J Herbin Bleu Nuit, a little greyer. I then tried it with a glass dip pen, and the results were much less distinct. The dip pen tends to produce a quite thick line of ink, and when thick layers of iron gall ink dry, they go a dark black regardless of what other colours are present, so the comparison is not that useful, but I made it anyway. I also threw in some Pelikan BB and some Diamine Registrar’s Ink too. So far I’m fond of this ink – respectable colour but with enough shading to stop it being boring, more vibrant on the page than the Lamy BB (which does get a bit dull to look at after a while) and with all the handy qualities of other iron gall inks, waterproofness, no feathering etc. I think I’ll keep it in the 2000 B for a while, or at least until I get some my next bottle of ink. 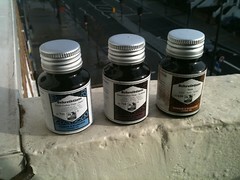 £4.20 for 50ml from The Writing Desk. I have had some believable recommendations for Diamine Majestic Blue, so I decided to try a bottle. You can see the results to the right, there; the full page is with a Lamy 2000 B nib, as part of my NaNoWriMo effort, and the other is part the same pen and also another Lamy 2000 with an M nib. The colour of this ink is extremely pleasant – and this is speaking as somebody who doesn’t generally like blue inks. It’s distinguished, vibrant and noticeable without being garish. The ink has a lovely metallic reddish sheen as it dries, too, which shows when the light is at certain angles. It flows extremely well, generously and reliably. It would be pretty much a perfect ink if it wasn’t for the fact that it smears not only just after it has been written with, but for literally days afterwards, even with a dry finger. For my NaNoWriMo I was writing on 90gsm Oxford paper, which is relatively “shiny” though not amazingly so; no other ink I used had that problem to anywhere near that degree. I did try it on several other papers, for example my Habana journal, with the same result. The ink seems to sit on top of the paper forever instead of properly drying and settling in. I’m afraid I can’t use an ink that smears to that degree. You can see the smearing on the NaNoWriMo page – that wasn’t due to any sort of effort on my part, just opening and closing the book, moving my hand across it occasionally while counting words perhaps. It’s a shame, since apart from this smeariness it’s pretty much perfect, with a gorgeous colour and a lovely feel when writing. I may experiment in the future with diluting it, which might possibly help the smearing issue. Having recently received (a) a number of nice new red inks and (b) a nice new scanner, I thought I would combine the two and compare a few different reds to each other. A selection of different red inks, next to each other. “Amazing Amethyst” does sound a bit like a type of chewing gum, but Diamine’s Amazing Amethyst ink is really quite a pleasant one, if not truly amazing. 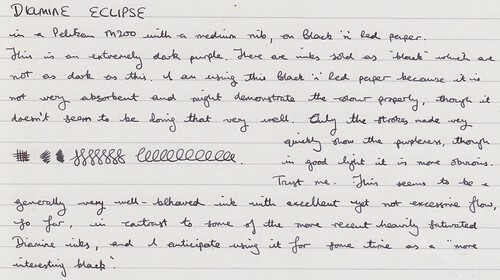 For reference I compared it to a couple of other purplish inks – J Herbin Poussière de Lune, and Diamine Imperial Purple. Unfortunately the pictures don’t really show very much difference, but you might as well see them, considering I took them. P. de Lune shades well and dries to a greyish mauve, which while pleasant and easy to read might be a little too muted for some people. On the other hand, Diamine Imperial Purple is a very vibrant ink with a strong purple colour. I found that the Amethyst was between the two in a very usable way – not so bright that it looks like paint or a gel pen, but slightly more colourful than P. de Lune. If you’ve tried the latter and thought “hmm, this is just slightly too grey for me, I’d like a little more colour” then you should get hold of some of this. I could certainly write quite a bit with this ink without it annoying me. Diamine Grey. Slightly water-resistant, in that it is visible afterwards and almost readable, but not pretty. Sailor Sei-Boku – the greenish blue “nanocarbon” Sailor ink. As befits an ink by a company called “Sailor” this ink remains identical no matter how much it is dunked into water. Sei-Boku is termed “archival quality” so really should be able to cope with being dunked in a sink. Waterman South Seas Blue, which is really a turquoise. Here we see the difference between a sailor and the sea. South Seas Blue, when exposed to water, is overjoyed and leaps off the page in ecstasy, to join its brother and sister molecules. A black Sharpie marker which I happened to have lying around. No nonsense here. Water? Why should it care about water? Try bleach or napalm to erase this sort of thing. Diamine Monaco Red which surprised me a little (though Diamine inks are not noted for water resistance generally). Monaco Red just vanishes with barely a trace. I’ll grant that that example of Monaco Red was likely contaminated with a lot of J Herbin Rouge Caroubier, since it normally dries to a brownish “there’s been a murder sir” colour, but even so… evidence has been eradicated. And then I had run out of inked pens so decided to try a pencil, specifically a 3B lead in a Caran d’Ache clutch pencil. Pencils have something of a reputation (in my mind anyway) for being impermanent, given that they can be erased with a piece of rubber, but graphite particles embedded into the surface layer of paper are apparently entirely non-bothered by the presence of water. I am really quite bad when it comes to Ink Philandering. 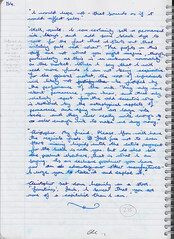 I just am not made to stay with just one ink; I refill pens at least once a day with some other colour which I feel will suit whatever paper it is I am writing on more, or suit the pen more, or because I feel more in a Diamine Dark Brown mood than a Noodler’s El Lawrence… it is striking me as a little pathological. So. I have picked one ink – Waterman Black, a reliable and fast-drying ink, good for all sorts of paper – and I am planning to use that for the next… well, I had originally thought “month” but that might be a bit too long. Fortnight, let’s say. I have loaded all of my normal pens with it, apart from the Kaweco Sport that I have loaded with red and use to make corrections and annotations after the fact (this does not count; this piece of asceticism is only for writing pens). The idea is that I will concentrate more on the actual writing. Let’s see how effective this actually is, in practice.